Are you ready for anything life throws at you? Would you be ready right now if a violent person or an aggressive dog attacked you? It doesn’t matter who you are, having the right tools to defend yourself is important for your health and safety — because you never know what might happen. Be smart. Be prepared, starting with today. It can be hard to know what self defense weapon is best for you when there are so many different types. Fortunately, SelfDefenseNinja.com gives you all the information you need to choose the right self-defense products for you — so you can feel safe and protected at all times. Not every type of self-defense weapon is legal in the state / country where you reside. Check your local laws before purchasing. Some personal protection weapons are very powerful or lethal while others simply stun or incapacitate an attacker, which is usually all you need anyway. Remember: a very powerful weapon always has the risk of severe accidental injury. If you are a busy person, look for something that is extremely ease to use and doesn’t require much training. An easy to use weapon will also ensure less chance of error when you are in a high pressure situation. Ideally you want to be able to carry at least one defense weapon on your person at all times. Something that is inconspicuous and easily concealed will help you avoid attracting attention and will also give you the element of surprise if you get caught in a dangerous situation. Most self-defense weapons are very affordable. A simple can of pepper (OC) spray will only cost you around 10$. That 10$ could mean the difference between life or death in a dangerous situation. Choosing a personal defense weapon for a female requires some further consideration. Typically I would stay away from batons or other melee weapons that may require a considerable amount of force to fend off a larger attacker. There are many products that are marketed specifically for female use. Some products (such as OC spray and tasers) can be disguised to look like a thing of lipstick. This allows for inconspicuous concealment and the ability to surprise an attacker. Effects can last longer than 20 minutes and affect everyone regardless of size. The active ingredient in pepper (OC) spray is oleoresin capsicum (OC), the same chemical that is found in spicy chilli peppers. 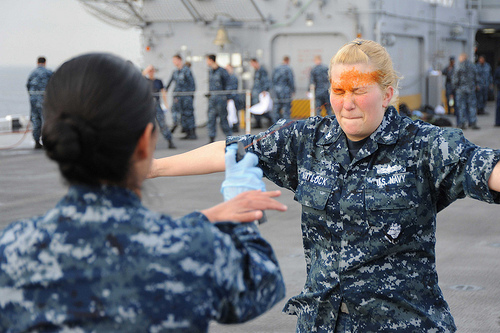 Pepper (OC) spray is used extensively by military and police units as a non-lethal weapon to subdue aggressors. It is also available for purchase for civilian use in most states for defense against other people or even dogs or bears. Pepper (OC) spray is an extremely effective self-defense weapon. It is powerful, easy to use, and comes in a variety of compact, pocket-sized forms. At about only $10 a canister, it is also one of the most affordable defense weapons on the market. OC spray comes in a variety of forms and sizes. Sometimes you can find sprays concealed inside lipsticks or other commonly carried objects. Most spray canisters are small and easily fit in the palm of your hand. Some are larger ones are the size of small fire extinguishers and are typically used for home defense. Aside from spray, OC chemical can also be dispersed in the form of a gel. Gel is useful when dealing with windy or rainy weather. 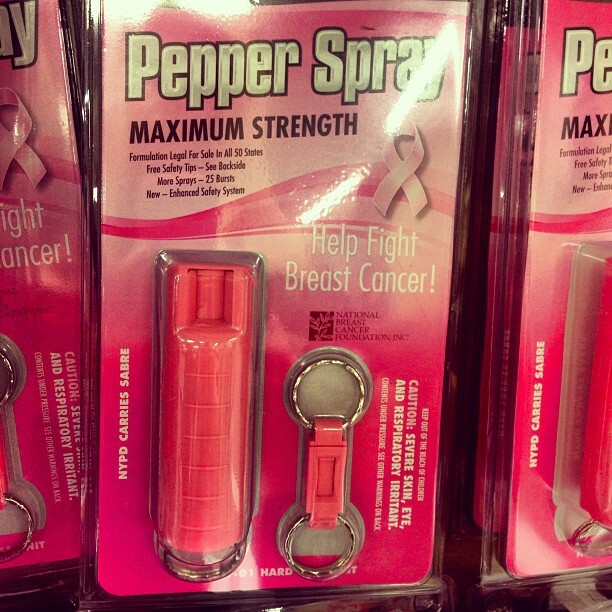 You can also find pepper spray guns, which have extremely long range but usually few shots. 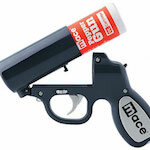 Some sprays also contain UV dye which can be used to help police to ID suspects after they have been sprayed. 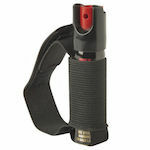 Pepper spray is a ranged weapon meaning you can deploy it from a distance, ensuring better safety. It is non-toxic and non-lethal. Inexpensive! A top of the line personal spray from Sabrered costs less than 10 dollars. Effects are extremely effective and last for over 30 mins, giving you all the time you need to escape. Does not work well in extremely close quarters. Does not work well in windy or rainy weather. Pepper gel can be used in these situations. Spray can get all over your clothes or in your house if deployed inside. The Sabre Red Maximum Strength (police strength) spray is one of the best compact pepper (OC) sprays that you can buy on the market today. It’s formulation is very strong and is similar to what is used by police units. Though I have never had the opportunity to use it on an actual person, you can get an idea of how powerful it is by reading some of the funny stories of accidental discharge on the Amazon reviews. What I like most about this spray is its compact form and quick release keyring action. I can carry this bad boy with me in my pocket easily, knowing that I can whip it out quickly if I ever encounter any dicey situations. This particular Sabre Red spray has a 25 shot capacity, which is very good for a canister of its size. At a price of about $10 on Amazon, this is definitely a steal. 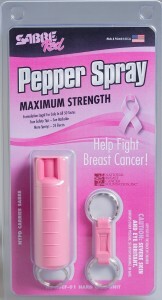 Compact spray comes in pink or black. Highly recommended. Start protecting yourself or your loved ones today! 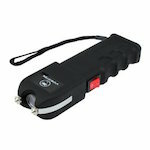 Stun guns are a type of self-defense weapon that uses an extremely high voltage shock (over 1 million volts!!!) 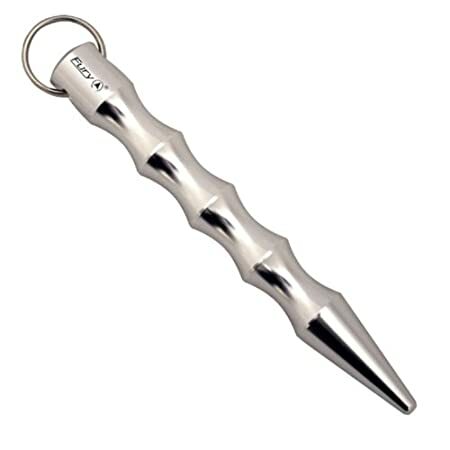 to cause involuntary muscle contraction and extreme pain in anyone who touches it. The loud crackling sound of the electric discharge is often enough to make an attacker think again. 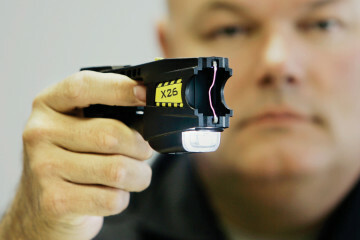 Stun guns are legal to purchase and carry in nearly all states. 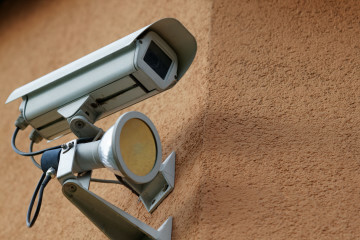 Find out if stun guns are legal in your state, here. They also work well in very close proximity. 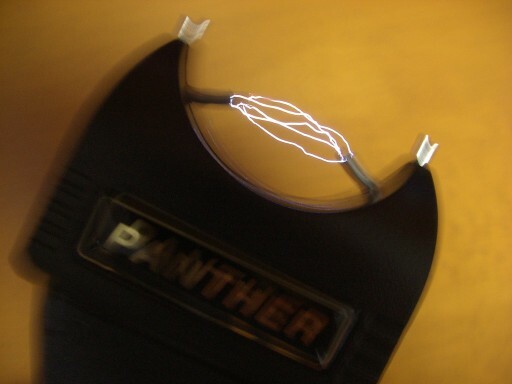 While stun guns can be intimidating and painful, the effects are only momentary. You also need to get up close and personal with your aggressor if you intend on using it. 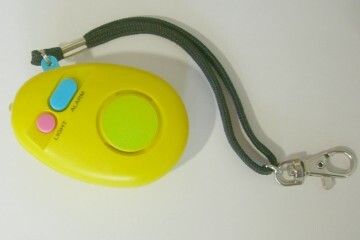 To operate a stun-gun you will also need to supply it with batteries, or recharge its internal batteries periodically. Normally, I like to recommend pepper (OC) spray — if you can only carry one weapon with you. 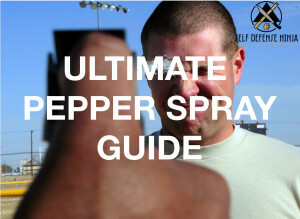 In most situations, pepper (OC) spray is a much more effective weapon than a stun-gun, since the effects last longer. However, I do think that carrying a stun-gun as a backup is a very good idea. If your attacker is right on top of you, it will be very difficult to be able to hit your attacker right in the face. 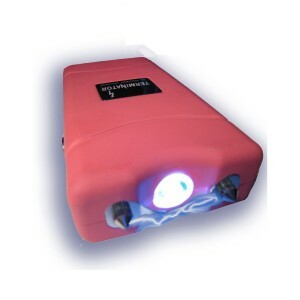 A stun-gun has the advantage of being able to target any part of the body. 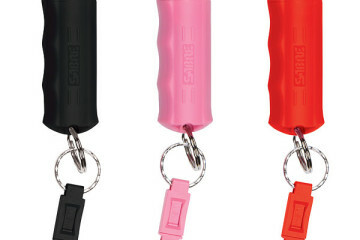 Stun guns are also very affordable (~10$) so it won’t cost you much to have to add it to your self-defense options. Strong deterent: 15 million volts! 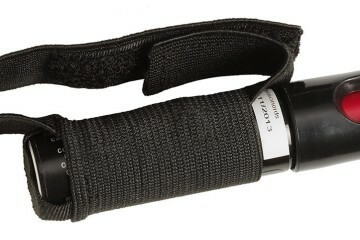 The Terminator 15,000,000 (that’s right 15 MILLION) volt stun-gun packs a mighty punch in a tiny package. 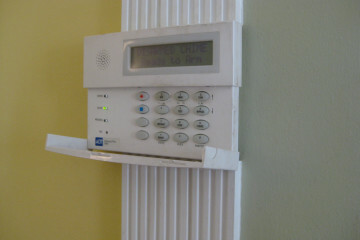 Turn it on and it emits a super LOUD crack when turned on — letting everyone know that you mean BUSINESS. Getting stunned by the Terminator is extremely painful and should be enough of a deterrent to stop most attackers. The Terminator has an internal rechargeable battery, which removes the need to find 9V batteries all the time. It also has a built in super bright LED light which is good for temporarily disorienting an aggressor, allowing you to move in for the “kill”. 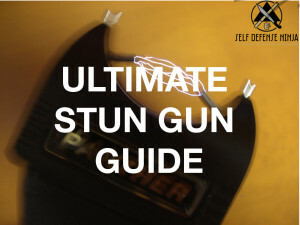 I think this stun-gun would make a perfect gift for any females in your family. It’s not expensive at all either, about $10, which is a small price to pay for the protection and peace of mind you get when you carry this stun gun. The cheapest I’ve been able to find the Terminator 15,000,000 is on Amazon (link below), but be aware that due to certain laws, it cannot be shipped to some states. 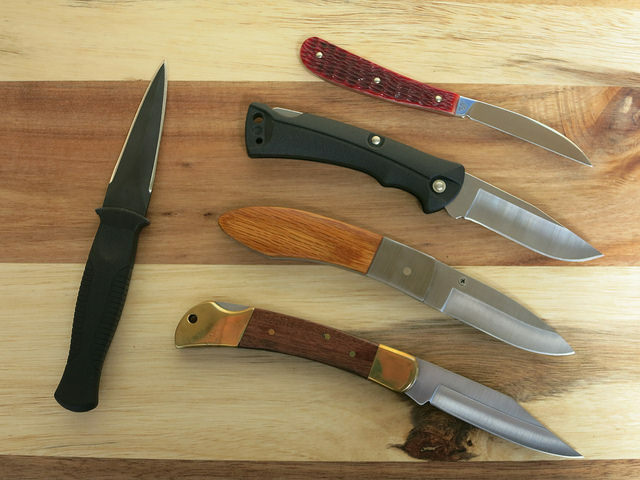 TAC force is a well known manufacturer of high quality and extremely durable knives. This blade in particular has a nifty spring assisted deployment which allows you to unfold the knife in an instant — perfect for when time is critical. Overall, this knife has a great feel. The size is just about perfect, and you will have no problem carrying this in your pocket or purse. The assisted unfolding feature is particularly nice for arming yourself quickly. I could see this being extremely important in a situation where seconds count and there is no room for fumbling. 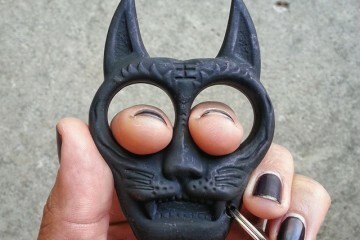 You can also easily open it without looking, or when it might be dark. Be prepared for the worst that life can throw at you. Being equipped with the right self-defense products can mean the difference between life and death. Have a peace of mind, starting today! If you have any comments or suggestions feel free to leave them in the comments section. Selfdefenseninja is a community focussed on self defense. We believe in empowering yourself to protect those you love. The first step is knowledge -- getting the information you need to prepare yourself for whatever life throws at you.